Orchestral Manoeuvres In The Barbican. Hm. 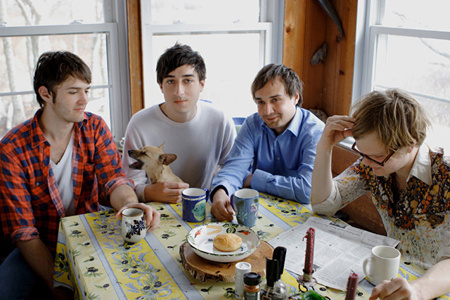 The Quietus was excited to learn that the excellent Grizzly Bear will be playing a collaboration with the London Philarmonic Orchestra at the Barbican Centre this October. New York is a fair stroll away, and we were sorry to not be able to make their Nico Muhly-arranged collaboration with the Brooklyn Phil earlier this year where tracks from Veckatimest were given new life. So we thought we dropped Grizzly Bear man Ed Droste a line to find out what the band had up their sleeves for the UK version of the event. So, Ed, why did you decide to bring the Grizzly Bear and orchestral extravaganza to Britain? "Well, as far as I understand it and I may be completely wrong, the LSO saw our performance with the Brooklyn Philharmonic and then a few months later I was told we were invited and naturally we were THRILLED at the prospect of getting to play with such an esteemed institution and in such a beautiful venue." We're glad you appreciate post-war London architecture. Will you be approaching it differently to the show with the Brooklyn Phil? The Brooklyn Phil show was both us and Final Fantasy performing our own sets with the orchestra, so our allotted time was a bit restricted, this show will be more songs (I believe the entire set) with orchestra, as well as further tweaking of pre-existing Nico Muhly arrangements. "We'll perform four or five of the songs he arranged for the Brooklyn Phil and then in addition to that probably another nine or 10. Those are rough numbers, but yeah it's a much fuller and longer orchestra experience and Nico is going to both do "subtle" arrangements for some songs as well as some songs we've given him free reign to 'reinterpret', so to speak. We'll see how drastic he takes it!" What have you learned from these collaborations? "That these things take LOTS of rehearsal, but ultimately they are one of a kind evenings that you never forget. They are exciting to us because it's totally a new way for us to perform and experience our songs, in a sense a new "version" if you will which keeps things really fresh for us." We hear it's hot in New York too - any tips for staying cool? "Actually it's just rainy and cloudy. Humid as well, but not swelteringly hot. I think it's probably hotter in London right now, but you guys are used to it. Watermelon juice is a good way to cool down. The ultimate summer drink."